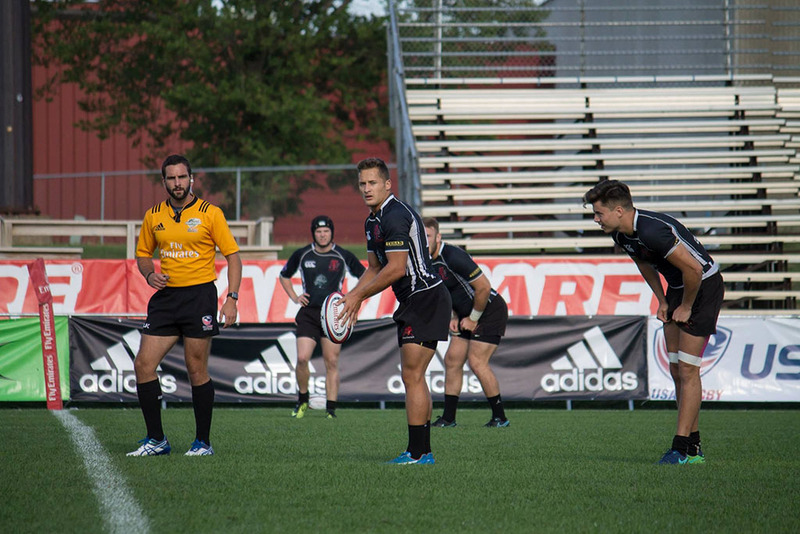 Last week, as the Lions were preparing for a regular-season test against Metropolis in Minneapolis, I was fortunate enough to be able to sit down with Patrick O’Reilly during the team’s training session. We talked about his time playing rugby and being a member of the club. I recall my first encounter with Patrick, early in my first season with the Lions. It was apparent to me from the start that this was a guy who cared very much about this club and the players. Over my tenure here (since 2012) Patrick has been involved in a huge way, and I believe he is one of the big reasons that we’ve earned the successes we have over that time, and before. Wagner: When did you first start playing rugby? Patrick then went on to play at St. Cloud State, and after that for Metropolis in Minneapolis for three or four years. He then moved to South Bend, Indiana and played for South Bend (now called Michiana). 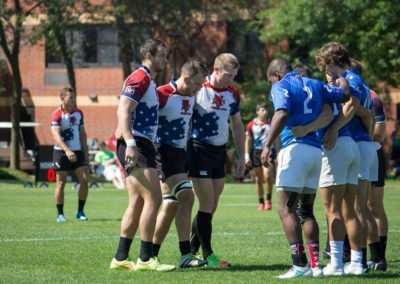 Wagner: How did you start playing rugby with the Chicago Lions? Wagner: What is your greatest Lions on-field playing moment? O’Reilly: “Probably those two seconds I stepped on the field for Super League (laughs). I was pretty geeked. I remember the training before we went to Belmont (Shore) in 2007 (for the Super League Final), that was insane. I remember, pretty vividly, when we played Team USA before they played England ‘A’ or someone. And we did really, really well against them. I mean they beat us, but we held our own for a long time. 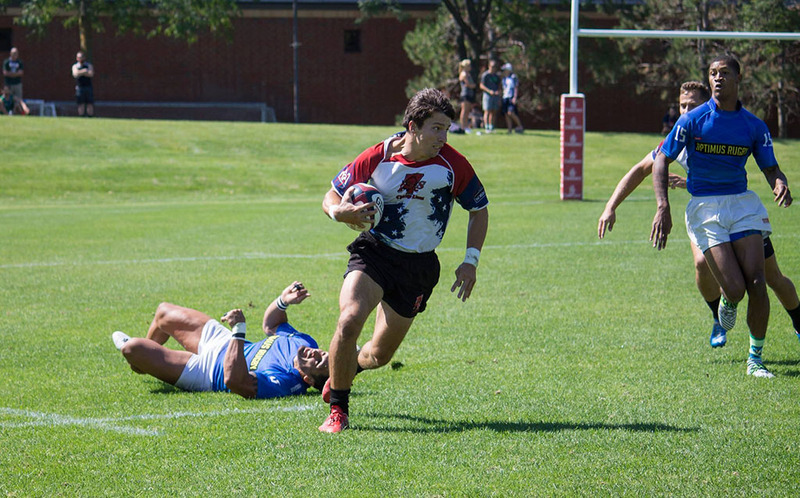 My favorite part of the years is LVI (the Las Vegas 7s Invitational, which the Lions won in 2010 and 2017). 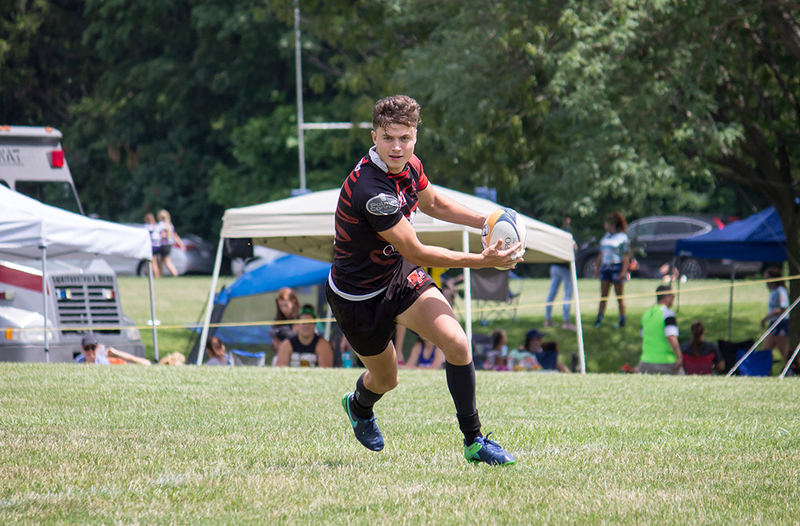 My second favorite is going to (7s) Nationals, just because of the environment. Wagner: What is your greatest Lions off-field memory? Wagner: One of the things I want to talk a little about is your relationship with Keith Brown and his time here with the club. He set some of the principles that we are really taking and running with now as a club. Simon: What would you say would be the biggest change you’ve seen since you started? O’Reilly: “The level of play. The seriousness (with which) guys take it. (People) don’t understand the amount of time that these guys put into it. They’ll train a minimum (of) six days a week when we get to this level. 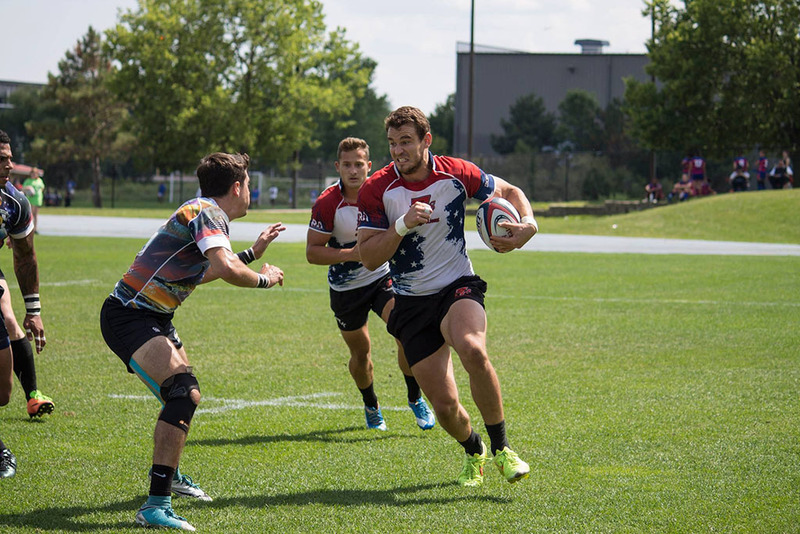 The 7s guys go seven days a week because there’s a workout that’s required, that’s checked. There’s fitness tests. And even on Sunday when you get back (from a tournament), there’s a recovery session, there’s yoga. From when I started, I mean, I saw guys smoking at half time! The level of coaching. I mean look, we’re sitting here at a lit turf field. Look at the difference just in this organization. Wagner: Where would you like to see the club continue to go? O’Reilly: “National championship. Two. And in order for that to happen, there needs to be support. I think the field is a big deal but I think the more we win, the more we’ll have support from Lions Old Boys. Involving the community more. One of the things I’ve always tried to do is be nice to everybody. And it helps. Be it the Griffins, the Riot, Metro. 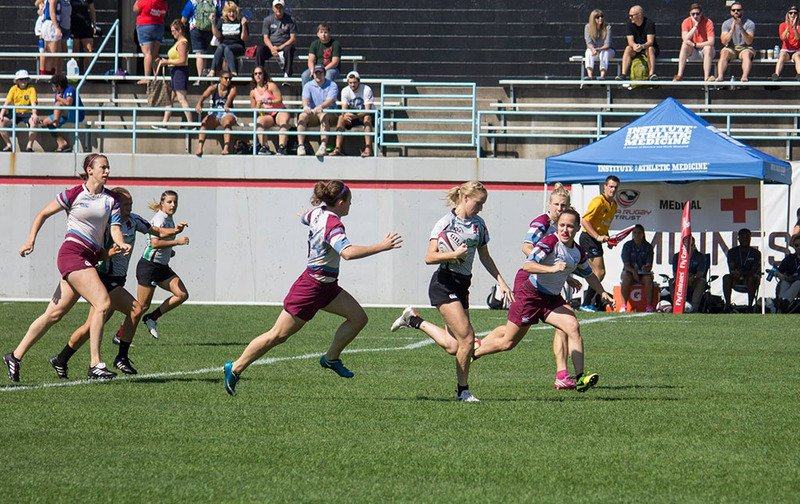 When we were going up to (7s) Nationals (in Minneapolis), for example, this year. Once we made it, Metro called us and said ‘You guys can use our field for free to train on’. We can have a swagger, you know, (but) there’s a difference between confidence and cocky. It’s building a culture, not only of winning, but a club culture. It’s an attitude that Aaron (Manheimer) instilled in his people that I’d like to see back. And it was ‘in my head, I figure nobody is going to do it, so I have to do it’. If we had all these guys that thought like that, and it is changing. The club was here before me, and it will be here long after me, and that’s got to be the mentality. And if (the players) can see it from me, hopefully that carries over. And it seems to, a little bit. Wagner: What would your advice be to a new guy coming in to the organization? Ever the club-man, I cannot say I was surprised by his responses. After all, for the last half-decade, these are principles that I have witnessed him both preach and practice. His love and care for the players means a lot to me, and I know it means a lot to the scores of teammates I have been blessed to know, play, and train with. Patrick is the kind of guy that, if it was within his power, he would do absolutely anything for you if you needed it, and never think twice about it. He has been a shining example of what it means to be a Chicago Lion. To carry yourself with honor and integrity, to train and play as hard as possible, and to never put yourself before the club. Patrick and his family (Lisa, young Callan, and the fourth O’Reilly on the way!) will be missed dearly in Chicago and by the club. His presence has been a massive one, and his boots will be very hard to fill by his successor. Patrick, words cannot accurately express the gratitude I have for your service to this organization. As long as I am here, I know I will do my best to pick up the torch you’ve carried for almost a generation and continue moving forward. I know there are dozens of my teammates and current club members who, because of your example, and because of what the Lions mean to them, will do the same. Click/tap above image to see larger. One Saturday in September 2017 marked a historic day for the Chicago Lions. The high school game featured two teams—Arlington Stallions and Chicago Wapiti—who are coached or led by Lions (Paul Bergman, Vinnie LaPiana, Roy Hays, and Mike Palmer). We had over 100 kids at our field with numerous parents in attendance. For their participation the kids were fed hot dogs and chips, which was greatly appreciated. Dave Clancy and Andrew Rose led and coordinated the Youth Development Day with Tristan Lewis leading the off-field duties. They put in a ton of work and the day ran like clockwork. 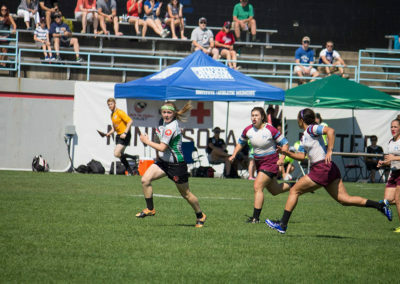 We had several of our top players and many North Shore Women RFC assist with the drills and numerous other players helping with the set-up, take-down, concessions and parking. It was a total club effort and we had numerous alumni there all willing to step in and help. We received compliments from many people and gave us confidence that this is just the beginning of future youth development days and we look forward to hosting one for the local community. 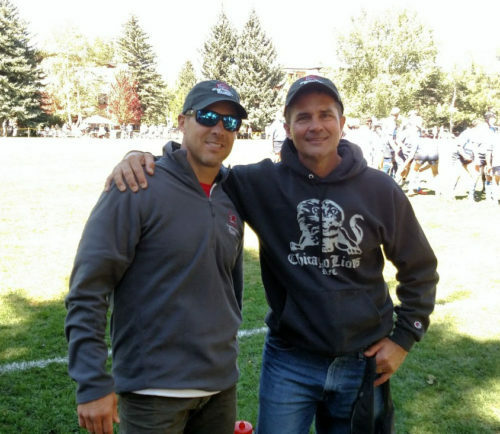 The Lions continue to step up our game on and off the field and we really look forward to having the alumni more engaged and supporting their Chicago Lions. 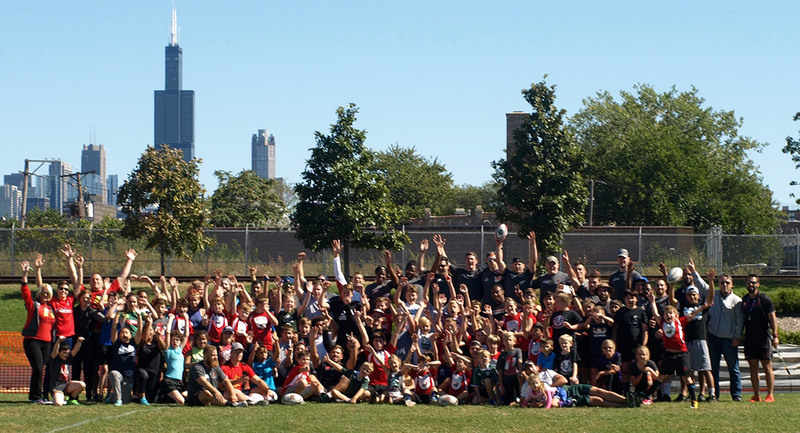 A special thanks to Dave Clancy, Andrew Rose, Tristan Lewis, Tony Rio, Patrick O’Reilly, Brittany O’Dell, Janet Kean (president of the Chiefs Youth Program), North Shore Women players and our Lions players for making the day a huge success. 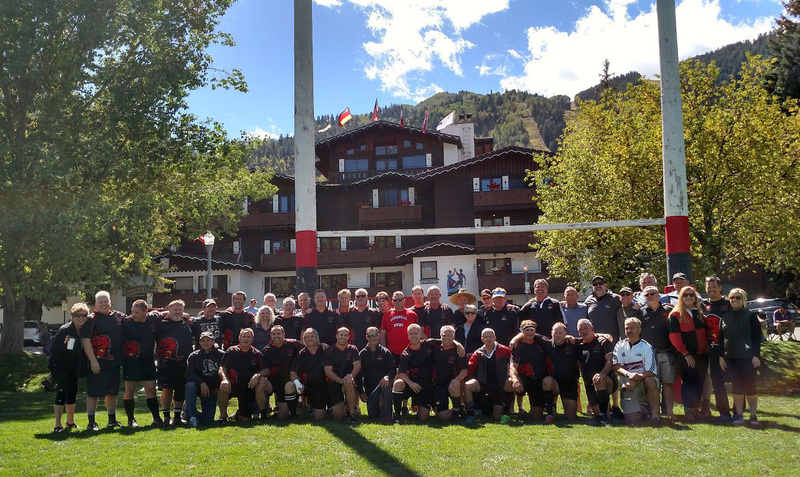 The Chicago Grey Lions played in Aspen for the 50th Ruggerfest with a strong contingent of players and supporters totaling almost 75. Fortunately or unfortunately, we had more supporters than players. It was a beautiful weekend and we played our only two games on Friday. We started with close to 25-30 players for the first game at 9 a.m. against the Virginia Cardinals who normally travel with 45-50 players. Despite the early start, we played hard but gave a few long tries away and could not score ourselves. Players were dropping quickly and fortunately, we had Mark Kaufman and Paul Hadden of AthletiCo there to fix the injured… just like old times. However, we lost the game 0-17. By the time the second game started at noon on the main pitch, we were down to about 18 players but picked up a few others. 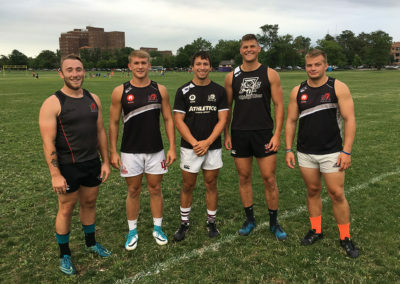 We played Mosman Rugby Club from Sydney, Australia, spending much of the game in their end with some high quality tactical kicking from hand and even took an early 3-0 lead on a Phil Olson penalty kick. 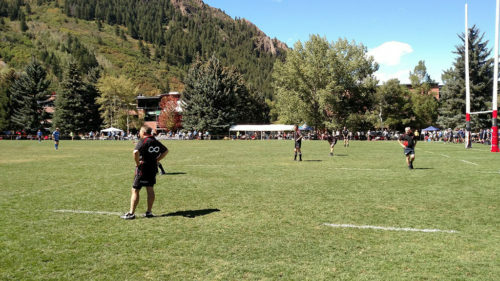 We played much better in this game but still could not find the try zone and lost 3-15. In both games, all the guys played hard and earned the respect of the opposition. 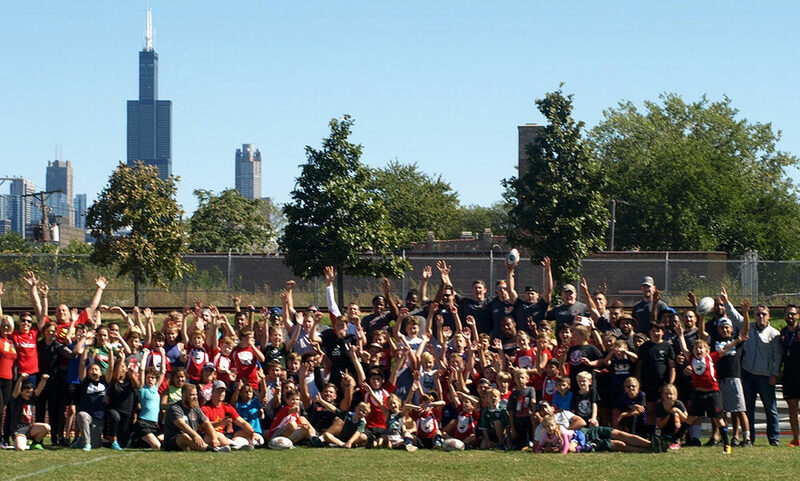 We had players from the following clubs besides the Lions; Milwaukee, South Side Irish, Louisville, Chicago Blaze. Thank you to those guys. 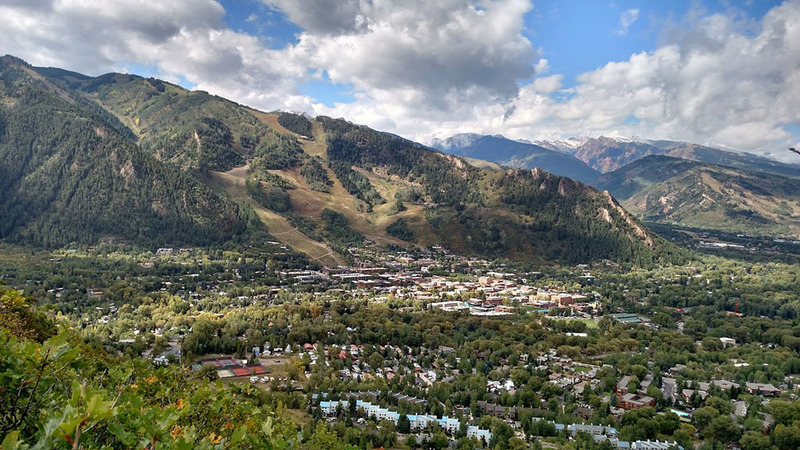 While some of us did go to play rugby, the majority went to enjoy the beauty of Aspen and spend time with old friends from all over the world. The Red Ski House was the Lions’ base with about a third of the people staying there. On Friday night, we had a team party with over 75 people. A special thanks goes to Mark Kaufman for funding this event and to Pat Bolger and David Skidmore for organizing. It was a great time with numerous past Lions Presidents in attendance. Normally, Saturday is a rugby day but for us, it was a touring day with watching rugby, hiking, fishing, biking… and sampling the local beer. The day ended with a happy hour hosted by Paul Hadden, Tony Rio and Billy Marshall before people went out to dinner and more partying. My last special thanks goes to Mark Sawicki and Mike Palmer for organizing the trip and rallying everyone. Mark did the recruiting of players and led us on the field. It was great to see Mark “ready to go to war” again, summoning his US Eagle playing days. Mike made sure we had plenty of water (and oxygen) and played hard as well. As President of the Lions, it made me very proud to be a Lion this past weekend. The friendships and camaraderie that we established years ago are still strong across generations. The pride of the Lions was on display all weekend and hopefully, rekindled everyone’s connection to the club. We have a great group of alumni and we all can be proud of the current coaching staff and players for continuing on with the tradition of all being Chicago Lions. 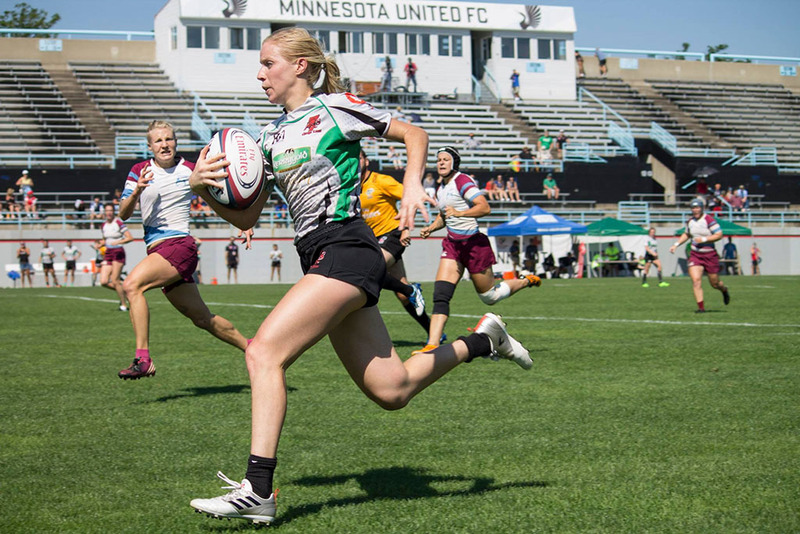 The Lions men’s and women’s 7s sides travelled to Blaine, Minnesota, to compete at the USA Club 7s Nationals. 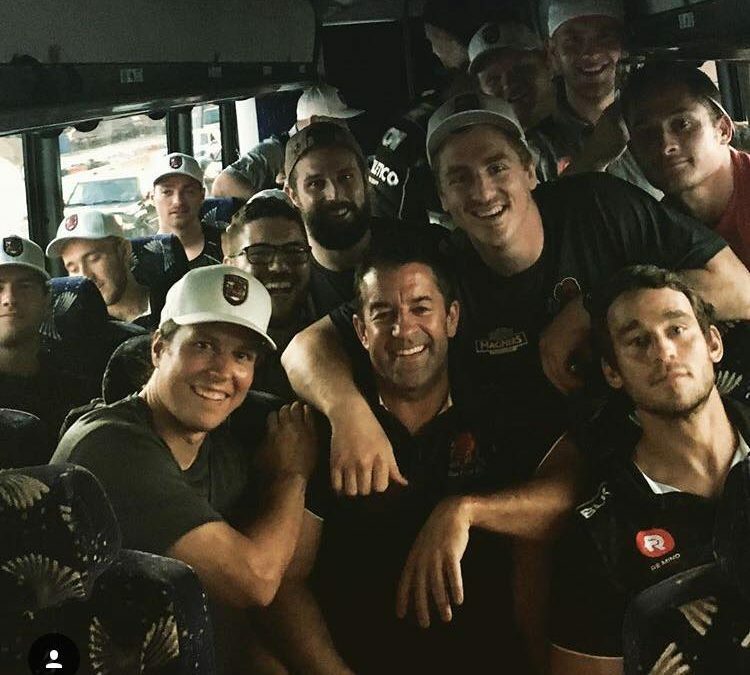 The teams spent Friday touring the facility before having a team dinner together where former South African 7s Legend Frankie Horne spoke to the group about winning before head coaches David Fee and Jeremy Nash presented their players with their jerseys on what was a a great night for the club. Saturday saw the teams get down to the business of winning games and attempting to qualify for the knock-out rounds on day 2. Both teams got off to strong starts winning their first games. We will start with the women. 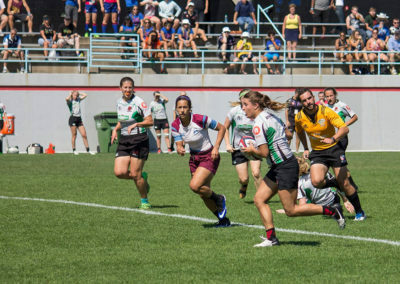 The women came out hot and showed no signs of nerves by beating Philadelphia 36-5 in a fantastic first game performance. 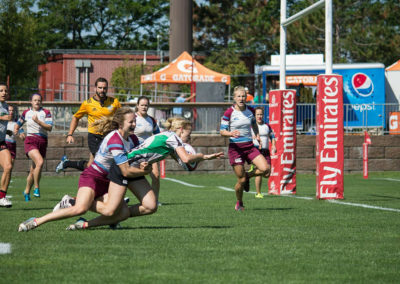 Tries were scores by Dash (x2), Kish, Devon, Jess and Creek. 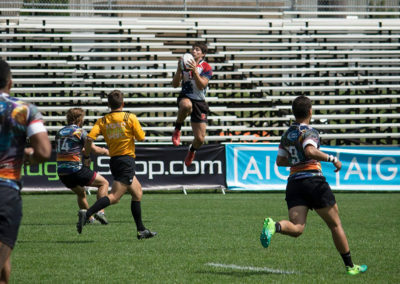 They then went on to play a very strong team in New York Rugby club who ended up the weekend in 3rd overall. 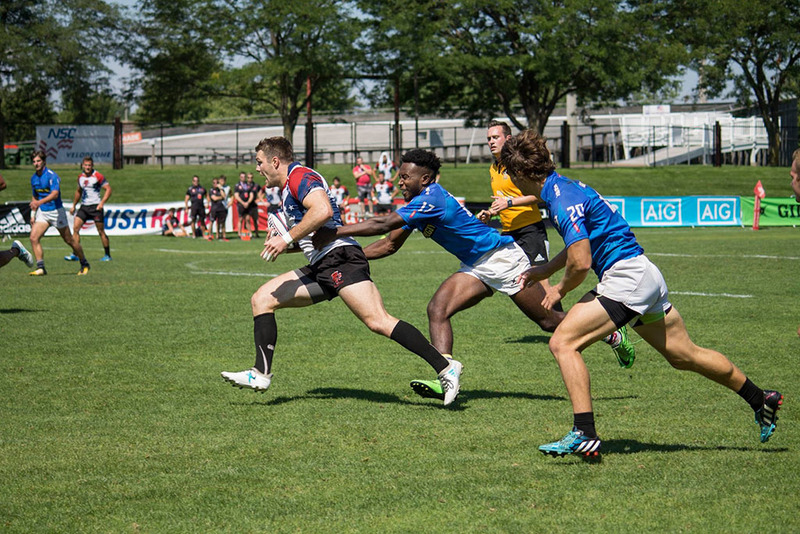 It was a closely contested game for the most part with tries from Dash and Creek keeping the Lions in contention, however breakaway tries from the New York side saw them run out to an eventual 26-10 win and the Lions knowing they needed to win their last pool game to qualify for the quarters. 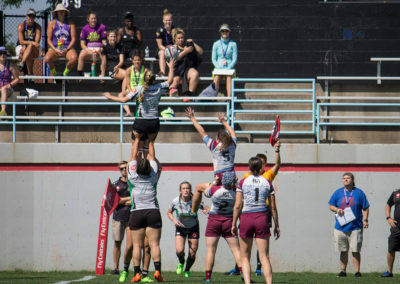 And they did just that, they came out firing against Austin Valkyries with a 24-5 win that was never in doubt and arguably one of their best performances of the weekend. 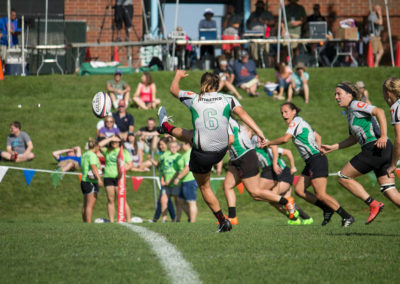 Tries in that game came from captain Kish (x2) Devon and Gabby. 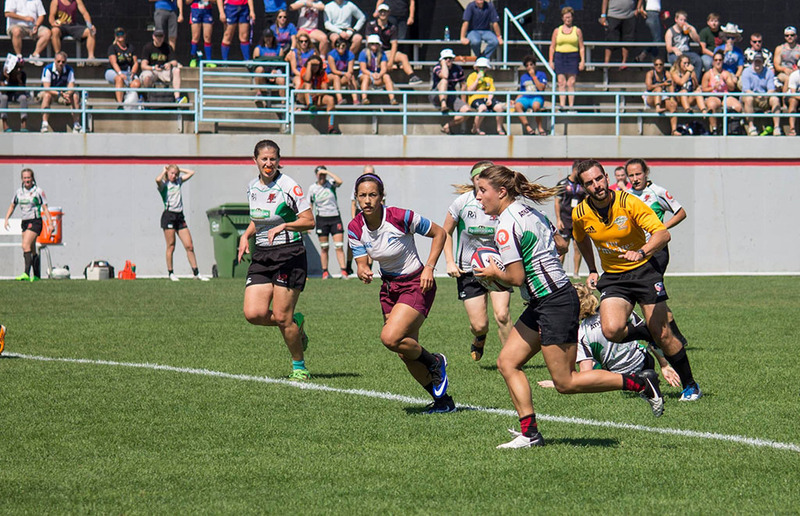 And with that the women qualified for the quarter finals on their return to the competition having not made it last year. Meanwhile the men were having a good day in the warmth and sun of Blaine. 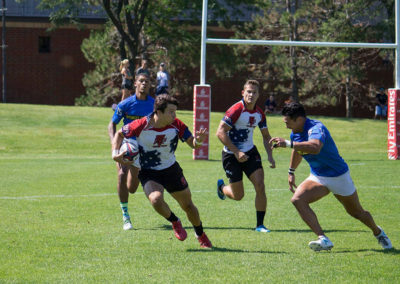 The men kicked off the tournament with a white wash of Optimus from Atlanta, a scoreline which would late prove vital to seeding out of the pool on points difference. Tries from Eddie Bluemel, Matt Wagner and JP (x2) lead us to a 26-0 win. Next up was the #2 seed from SoCal, Santa Monica. The men backed up the first result in what was a hugely physical game with tries from Jack, Eddie and Wagner rounding out a 15-10 win. 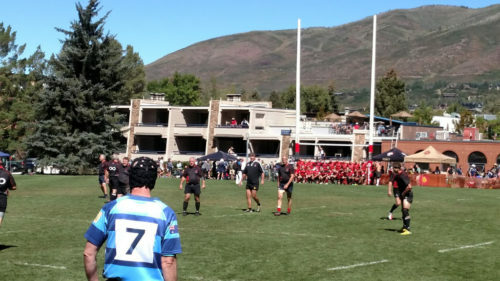 The last pool game of the day had the Lions play one of the tournament favorites in Life West from San Fransisco in what would prove to be a heated affair. 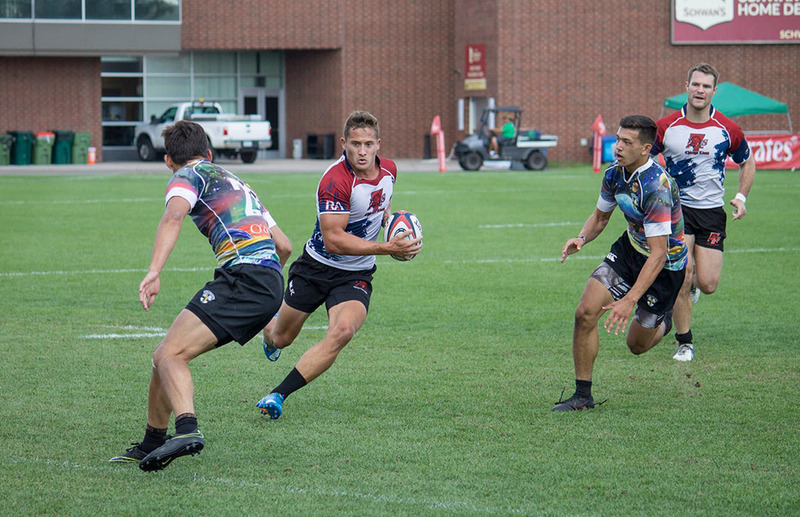 The game saw the Lions take a 12-0, during which time there were two yellow cards, one for Life and one for Michael Ziegler in a contentious incident which saw him protecting his teammate after the scoring of a try, only to see yellow and make it 6 vs. 6 with a minute to the half. Life made the most of the short numbers and scored just before the half to make a game of it second half. Life came out a new team in the second half and despite the Lions best efforts they were not able to increase their lead. 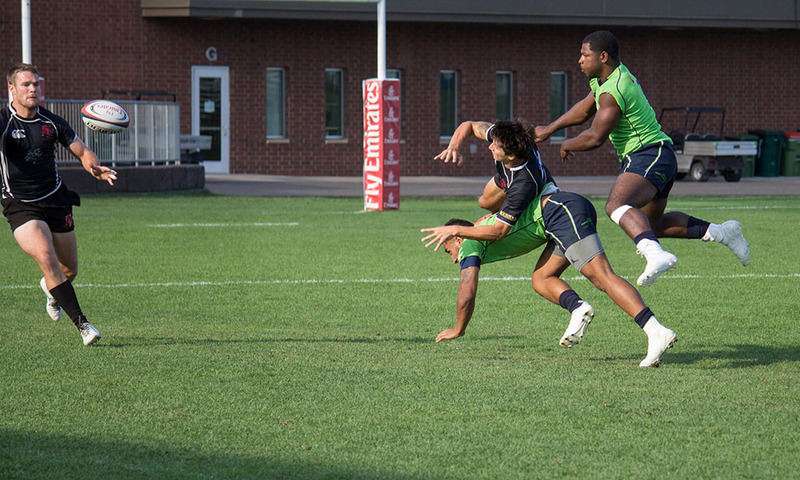 Life finally got possession back and in the dying seconds managed to punch in what would prove to be the winning try. As it turned out the Lions would still go through first seed on points difference with three teams in the pool finishing with a 2-1 record. 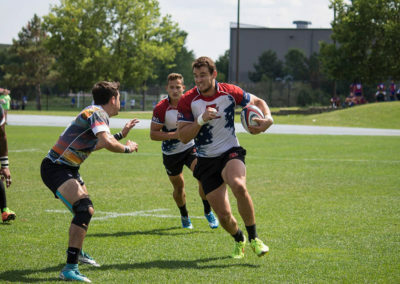 It was time for the men’s and women’s teams to head back to the accommodation and focus on recovery and video review ahead of Sunday morning quarters against Belmont Shore and Life West respectively. 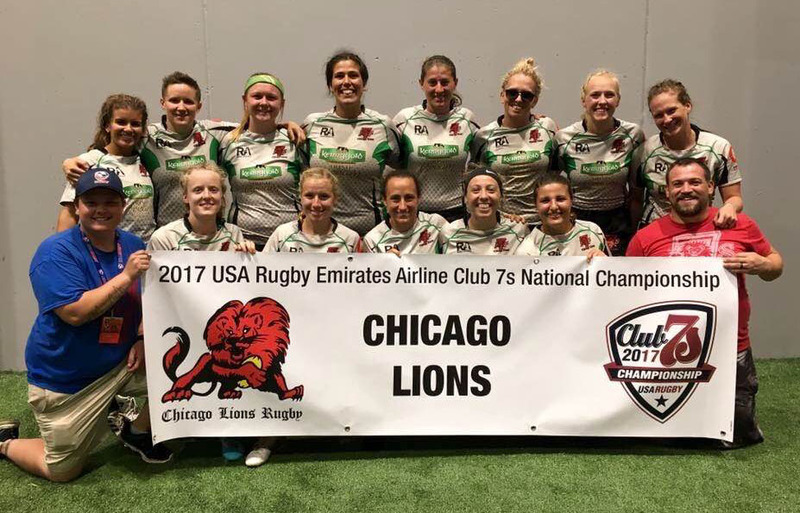 The women were first to take to the field on day 2, cheered on by a growing contingent of Lions supporters who had made the trip including teammates, parents and club president Jeff Simon. This was truly special to have our own pocket of supporters in the stand for every game and something all the players are really grateful for. 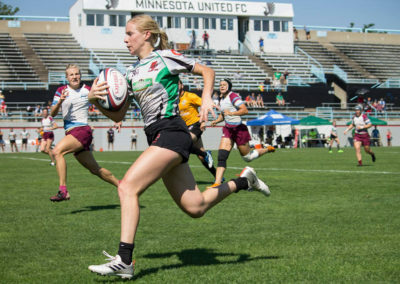 The women went up against current 15s national champions Life West in what were difficult conditions with rain coming in over the Blaine Complex. 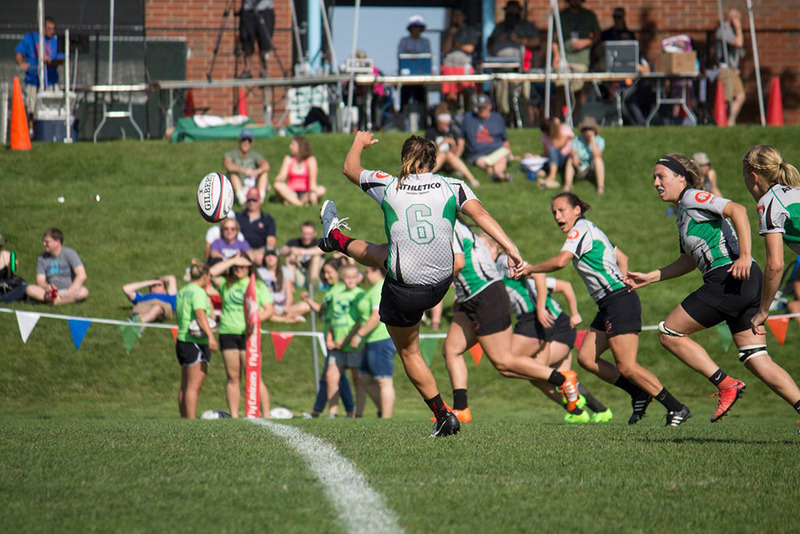 Tries from Brittany “Chip” O’Dell and Kish kept it close but handling and defensive errors gave Life West possession for large parts of the game and they showed their quality in finishing victorious with a score of 12-22. The women will be proud in the knowledge that on a different day with a few less errors that this was a game they could have take and that they are not far off where they need to be to beat the top teams in the country. The women got an unlucky break after that as a shock result saw the ARPTC academy also knocked out in the quarters and scheduled to play the women Lions. 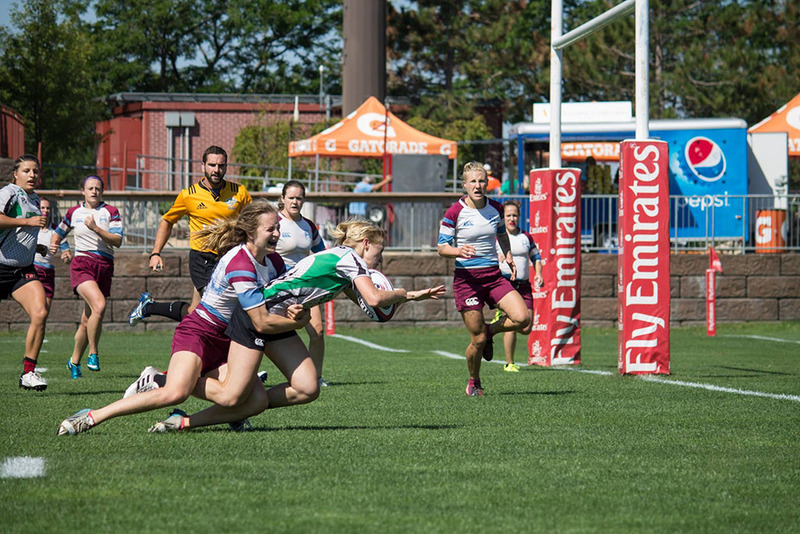 The women went 7-0 up through a try and conversion form Chip and looked in a great position moving forward. 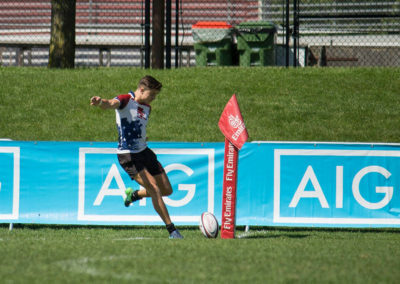 A try from ARPTC saw teammates Kish and Dash collide and saw Dash removed from the field after a length spell of treatment from Athletico Physio Ryan Jarema. This was a big loss for the women and a shock to all to see a player go off with a head injury. Thankfully Dash was okay. 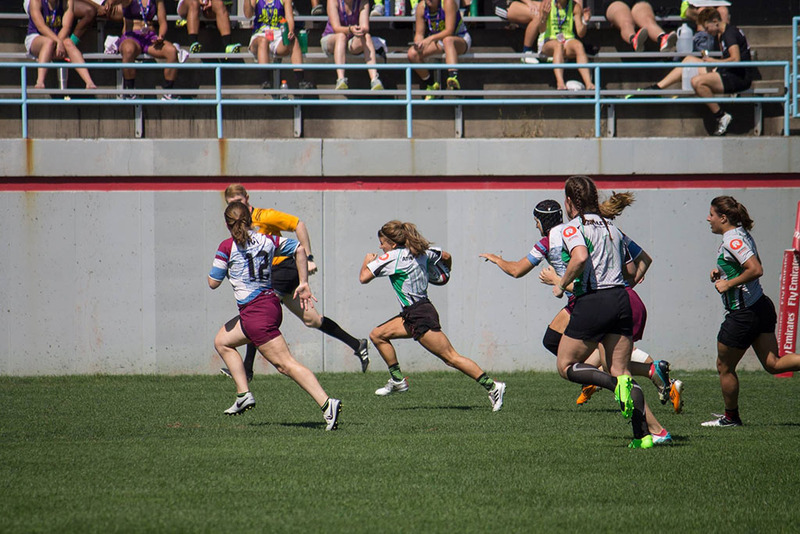 The women lost 7-26 in a game that ran away form them after that. 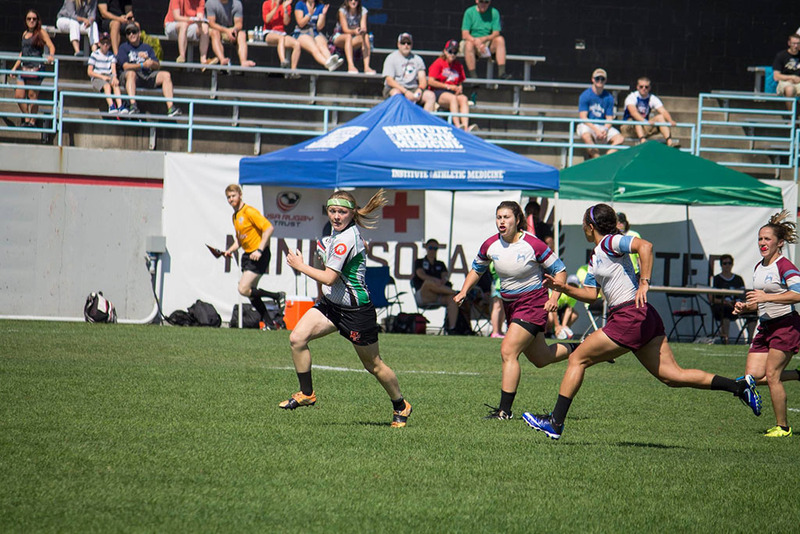 The women found themselves playing for 7s against NOVA. 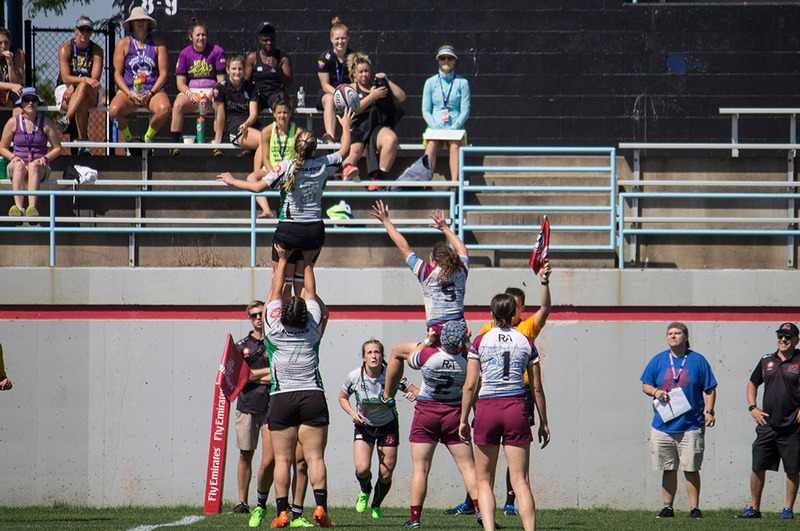 They were determined to go out on a high against what has historically been a strong women’s 7s side. The women had a reshuffle of the starting team and came out with an inspiring 33-10 victory to finish the day on a high and do the club extremely proud. 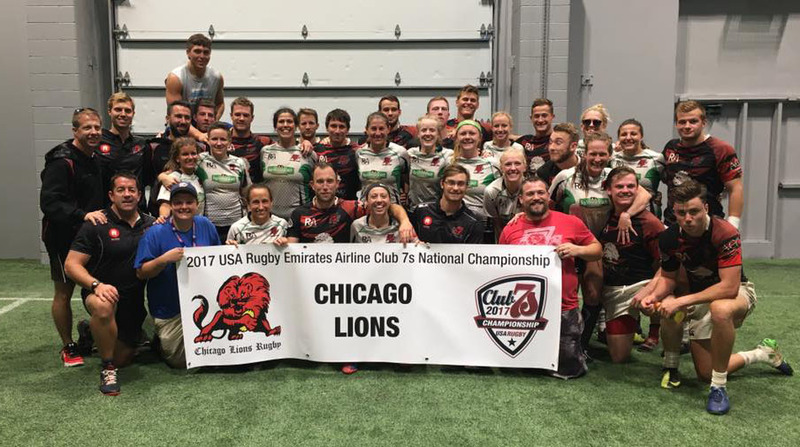 The Lions were one of only two clubs in the country to have both their men and women qualify for nationals and now we had both teams rank in the top 8 in the country to follow up both winning the Midwest championship in what has been a tremendous year for the club. 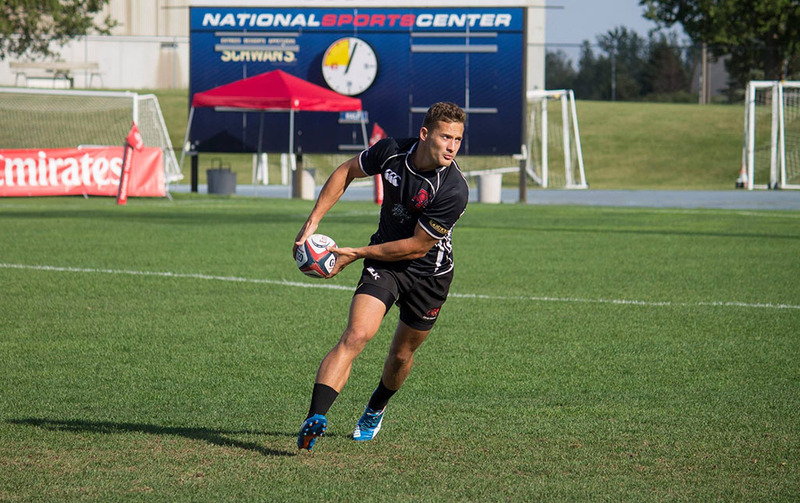 On the men’s side, a quarter final against a big Belmont side awaited our men. Belmont lead the country in nationals appearances and victories but looked like a team that we should beat having watched them stutter on day one. It was a case of a perfect storm for the Lions where things just didn’t go right all game. Decisions went against us and ultimately we never got into our pattern. The game went down to the final seconds with tries coming from Brady and Jordan but it was Belmont who edged it 14-17. “Two missed tackles was the difference in the Old Blue match. The boys did pull together and show their potential to finish in style though with a thumping victory over Life West, payback for the result the day before. 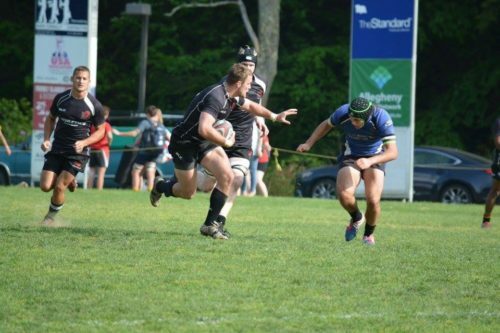 Tries from Feakes, Brady, Casey and JP handed the Lions a 26-5 win to round out the tournament placed in 7th. “I feel for the guys, and for Eddie Bluemel who is off to retirement… I wish we could have sent him off on a higher note. His calmness and approach to the game will be missed. The players, coaches and management would like to thank everyone from the club for their support all summer. While narrow losses are hard to take, we will look back in a year which saw the Lions win 3 Midwest championships. 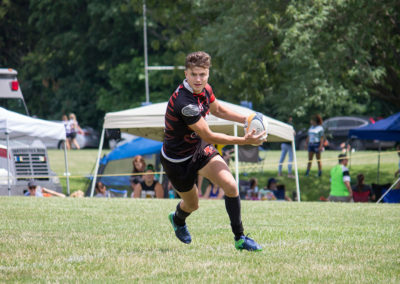 Men’s 15s and 7s, along with women’s 7s, makes a statement as a club with some huge results at a national level that this is a club on the rise and one heading towards the very top. This is just the start of what is going to be a journey toward being the number one club in the country. Thank you to all to all the sponsors and GoFundMe donations which made the travel and logistics possible, your ongoing support is truly appreciated and not taken for granted. 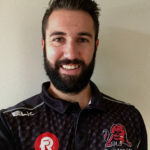 Lastly from me, a big thank you to our two fantastic head coaches in David Fee and Jeremy Nash, we are so fortunate to have two coaches of your calibre leading our 7s programs. To Patrick and Tator for managing the teams all summer, a tireless job which deserves huge credit, we thank you. To our captains, Matt Wagner and Sarah Kish, for leading from the front all summer and sending such high standards for the players on and off the field. 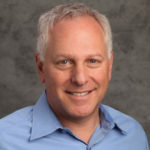 To Tom Argy for supporting our men and women all summer with video analysis and lastly, Ryan Jarema, who was run off his feet all summer treating up to 4 teams at a time on any given weekend. We are so fortunate to have such a great support staff as a club and I am excited to keep moving forward with what is now a very tight knit family. 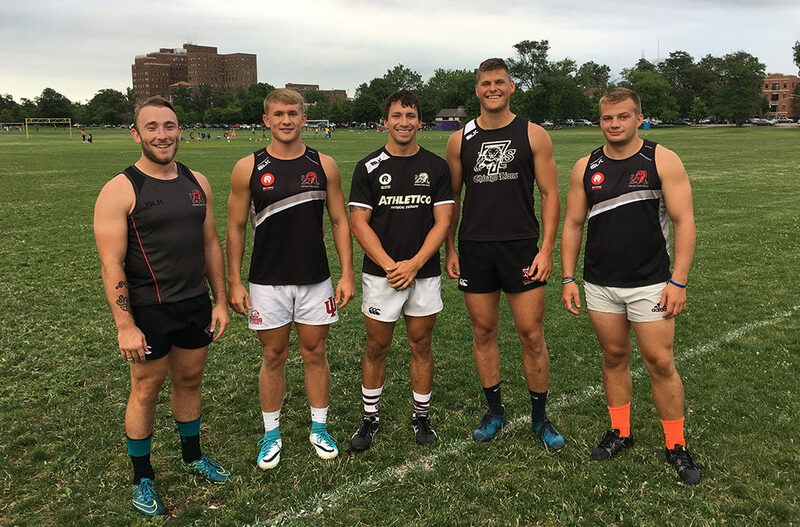 Feakes and Sousley were acknowledged for both 7s and 15s, Dorrier and Casey gained recognition for their 7s exploits, while Kacor and Brady excelled in 15s. We are extremely fortunate to have this group of talented young men coming through the ranks and are excited to see their development with the Lions over the years to come. 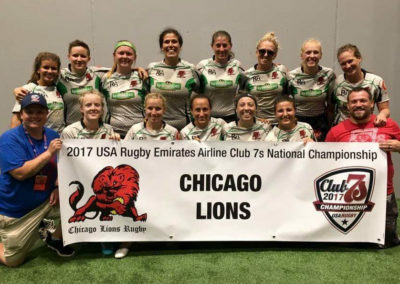 The Chicago Lions headed to Pittsburgh on May 19th for the National quarter-final and semi-final having secured the Midwest title two weeks previous. The Lions first opponent was to be Rocky Gorge, a team from Baltimore who went unbeaten in their conference all season. 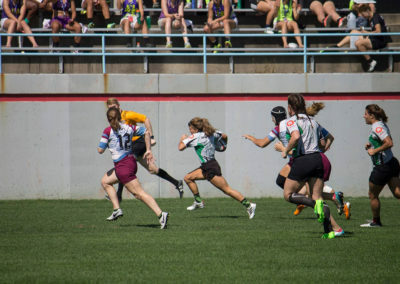 The quarter-final was played on the Saturday as the last game of the day in a packed schedule which saw 20 men’s and women’s teams take to the two fields of the Pittsburgh Harlequins. The Lions started with a team of Frikkie De Beer, Patrick Rappleye, Angus MacLellan, Mike Rasmussen, Joe Forgy, Thomas Kacor, Dave Whitney, Ethan Porter, Kevin Lydon, JP Eloff, Sondai Adjei, Luke Thiem, Dan Coci, Brian Rooney and Quinn Macali. The Lions were first on the scoreboard with a penalty from JP Eloff which was then followed up by a try by Luke Thiem. Eloff hit the conversion to give the Lions a 10-0 lead early on. Rocky Gorge responded with a long range penalty from US National flyhalf Ben Cima before punching a try of their own to leave it 10-10 at the half in what was proving to be a tight encounter. 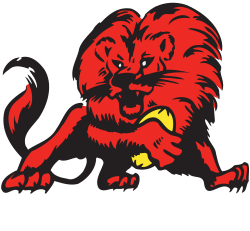 Rocky Gorge came out of the blocks fastest in the second half with a try to leave it 17-10 but the Lions got going and were ruthless for the next 30 minutes, scoring 22 unanswered points through tries from Jon Serdar, Sondai Adjei and Frikkie De Beer to lead 32-17. 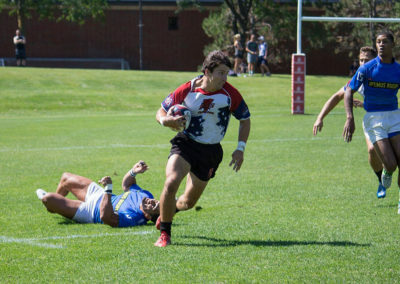 The major blow coming from a desperate crossfield kick attempt by Rocky Gorge being plucked out of the air by Adjei and finishing in a try for the Lions by the support play of Captain Dan Coci. This allowed the Lions to empty the bench in an effort to save energy for the Sunday game. 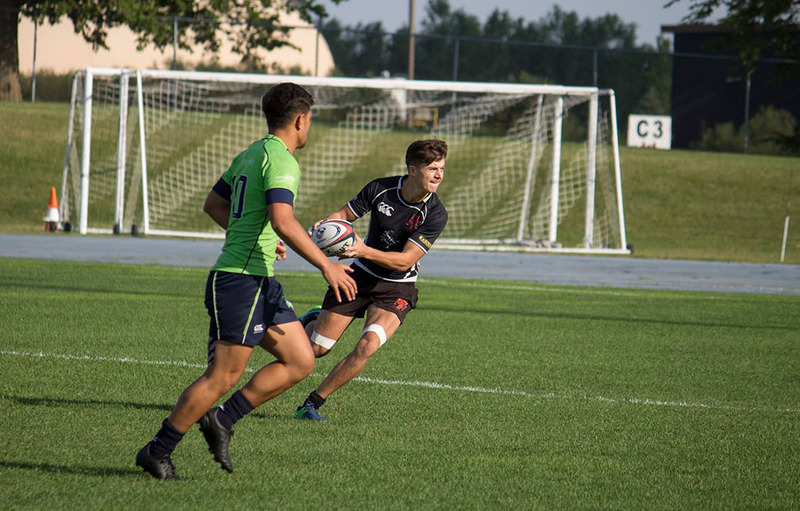 Rocky Gorge did have the last say with a consolation try in the final seconds but that brought an end to play and a fantastic win for the Lions 32-22 on the day and on to the National semi-final. The Lions did not stick around long after the win as they darted straight to the cars and onwards to the AHN Sports Performance Center, a newly built state of the art sports facility which is used by the Pittsburgh Steelers as well as other professional teams in the area. The players participated in 2 hours of recovery protocols ranging from massage to H-Wave stimulation and cryotherapy, the latter sorted the men from the boys as they were exposed to temperatures of around -200 degrees. Sunday saw another game for the Lions against New York Athletic Club (who had taken down last year’s National Champions, Mystic River on Saturday). The Lions were up early again for a repeat of the match day routine which sees them go through a pool activation session including hand-eye coordination drills, mobility work, and active recovery. This is followed by breakfast as a team and then opposition preparation which sees the players go through video analysis of their opponents. Next up is a walk through in the car park where they spend a short time walking through set-piece moves before breaking for lunch and strapping. 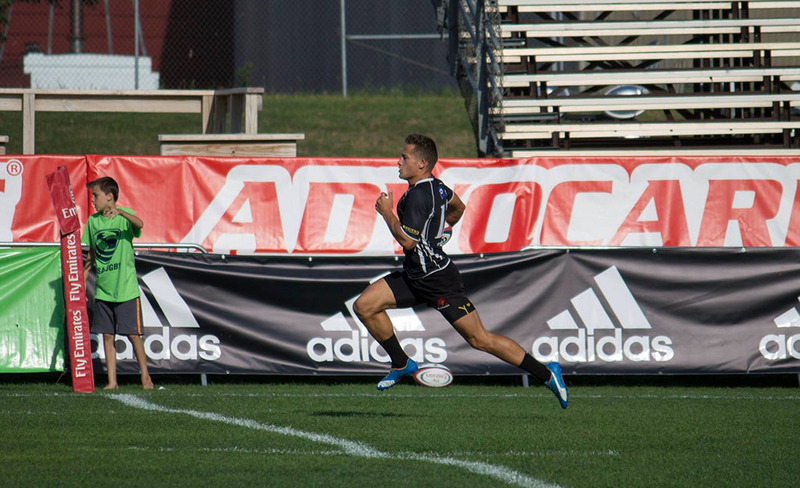 The team was announced with the return of Andrew Rose from injury and Robert Stortz. The starting team was: Frikkie De Beer, Pat Rappleye, Angus MacLellan, Jon Serdar, Joe Forgy, Thomas Kacor, Dave Whitney, Andrew Rose, Kevin Lydon, JP Eloff, Sondai Adjei, Luke Thiem, Dan Coci, Brian Rooney, and Robert Stortz. The Lions departed for the field with rain and storms being predicted. The weather predictions did not disappoint with the skies opening up mid-way through the team warm-up to provide some very wet conditions for the game ahead. 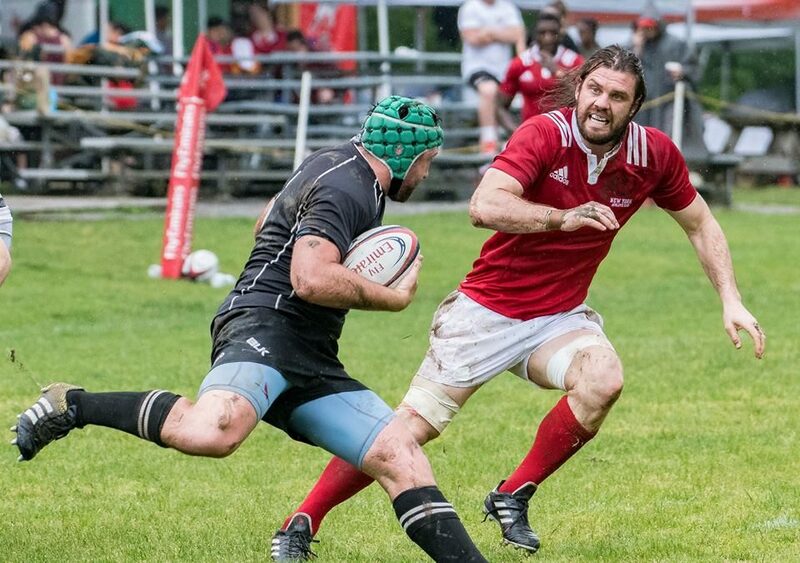 The Lions took the field in heavy rain against a team littered with US National players and an extremely big pack. 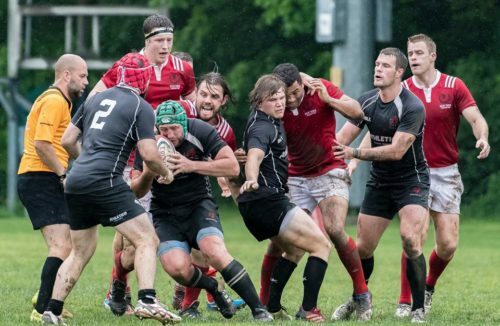 ‘We were expecting a forwards game from them and the conditions played right into their favor’ said coach Dave Clancy. The game started slow with both teams struggling in the conditions and trying to kick territory when possible. 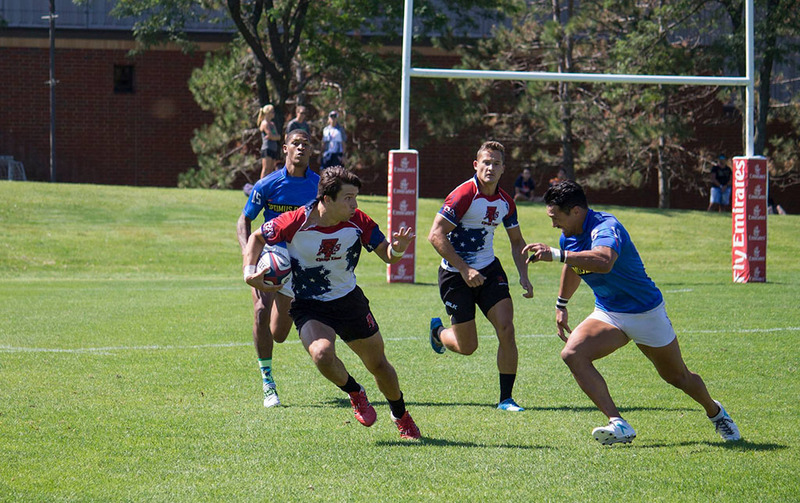 NYAC then opened the scoring after some good pressure and a lengthy period of Lions defense. They backed this up with two long range penalties to lead 13-0 at the half. 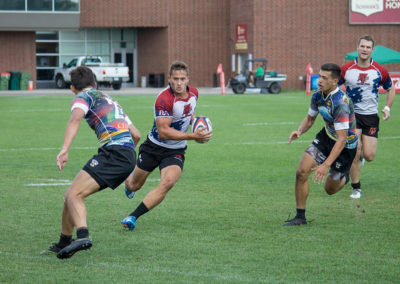 The Lions were disappointed to have left a try out there with the referee judging the pass to the man overlap to be forward in what would have been a walk-in try. 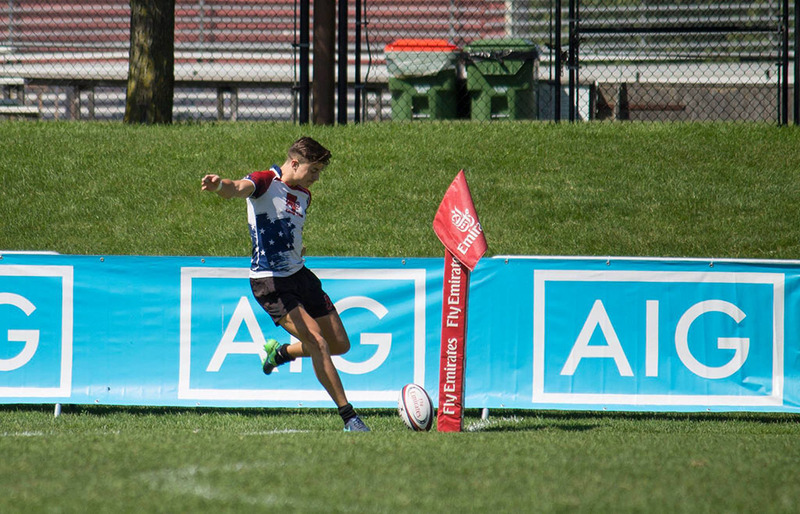 NYAC were first to score in the second half with a converted try giving them a 20-0 lead. Next, the Lions responded through a Brian Rooney try to leave it 20-5 with the Lions growing into the game and starting to have some possession in key areas. 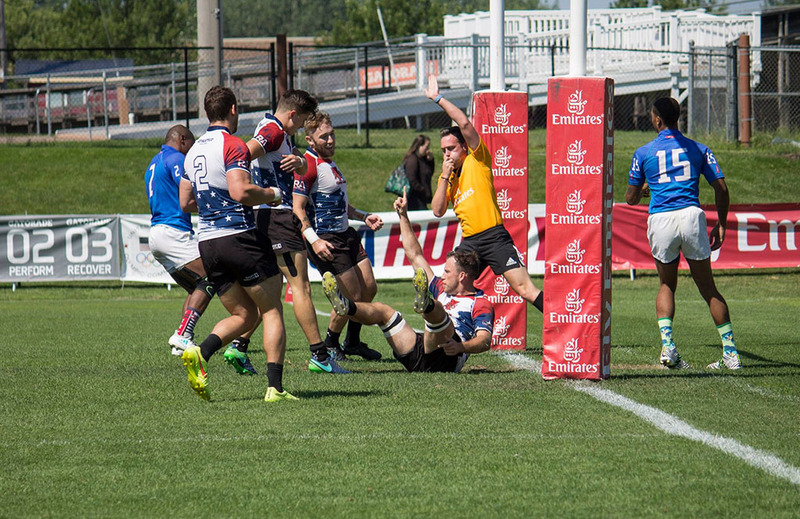 The Lions were then held up for what could have been a try but it wasn’t to be and NYAC cleared their lines. The Lions threw everything they had at them and emptied the bench in an effort to get some fresh legs and energy on the field but it wasn’t enough against an excellent NYAC side who played the conditions perfectly. 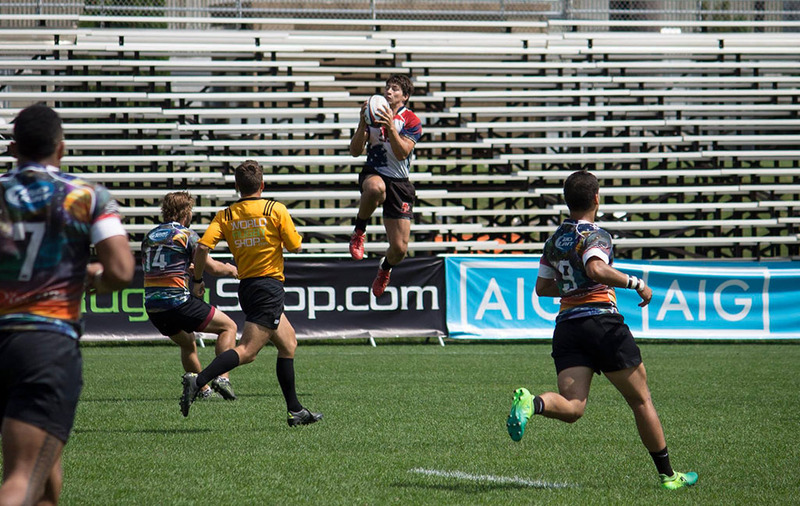 Their talented flyhalf, Chris Mattina, and very strong fullback put on a superb kicking game. 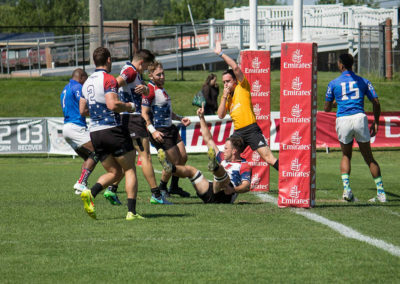 NYAC scored again at the death as a bonus to leave the final score 5-27, a win that sent them to the National final against the now-professional side of the Austin Huns who defeated Belmont Shore in the other semi-final. It draws a close to the season for the Lions team who have come a long way from a 3 game losing streak in the Fall to where they ended up. The team has gone from the bare squad numbers for a first side to having two full sides. The Lions have laid a solid foundation for future success and have in the words of many old boys, restored the roar. 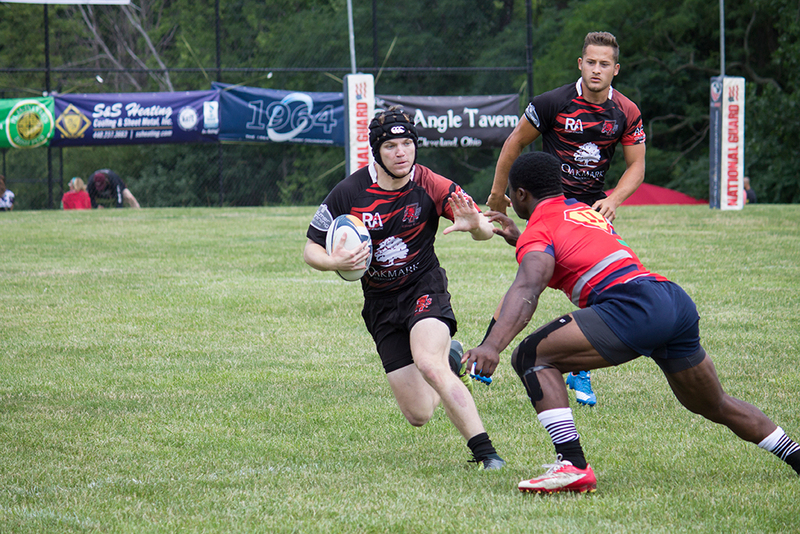 The Lions traveled to Lemont on Saturday for the Midwest final against top seed Columbus. It was a going to be a big challenge to take down a team who had the top seed having been bolstered this season by the additions of 6 players from th Ohio PRO team, but the Lions were up to the task having come within seconds of taking the victory against them on the road earlier in the Spring. The Lions started with a team of Frikkie DeBeer, Pat Rappleye, Angus MacLellan, Joe Forgy, Mike Rasmussen (R), Thomas Kacor, Dave Whitney, Eddy Long, Kevin Lydon, JP Eloff, Brian Rooney, Luke Thiem, Dan Coci (c), Sondai Adjei and Robert Stortz. 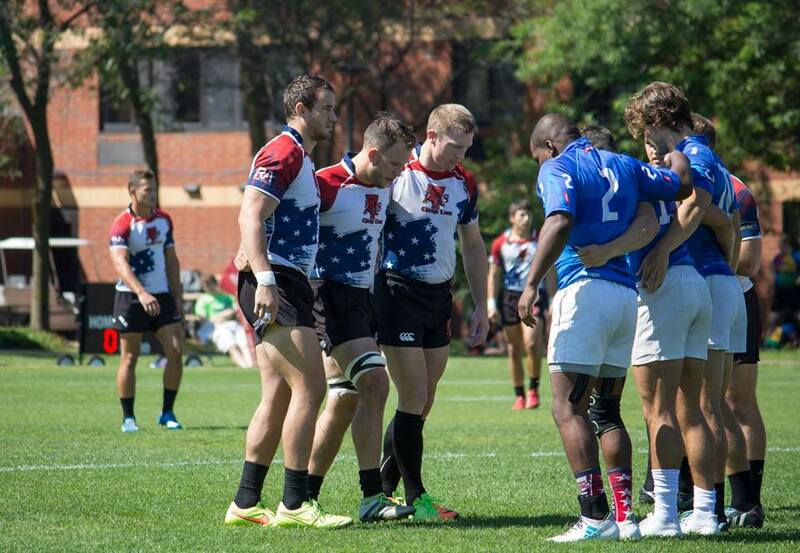 Opting to keep faith with young rookie Mike Rasmussen after his man of the match debut start in the semi-final. The Lions were the first on the scoreboard after some early pressure from some lineout drives led to a penalty and eventually Pat Rappleye barging over in the corner from the drives momentum. 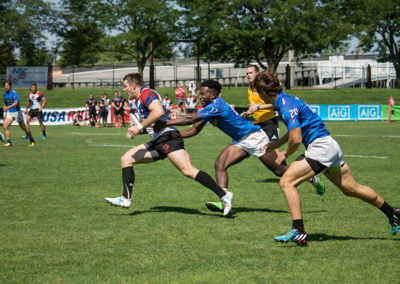 Columbus reacted with a line break from former eagle Roland Suniula who connected with his team mates through a number of offloads before it ended up back with him for their first score of the game, converted by Taylor Howden. The Lions were next to score through a JP Eloff line break and an easy pass to put flanker Thomas Kacor in the corner. 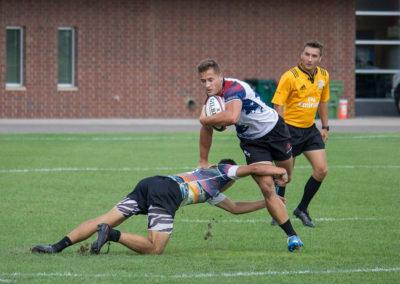 The Lions increased their lead to 15-10 when JP Eloff took 3 points from a Columbus penalty before a lapse in concentration in defense saw Columbus with a break away try up the middle to leave the score 17-15 to Columbus at the half. However, that was not the last of the drama as Columbus center Suniula saw a red for a dump tackle on Robert Stortz in the closing minutes of the half meaning the Lions would finish the game with an extra player. 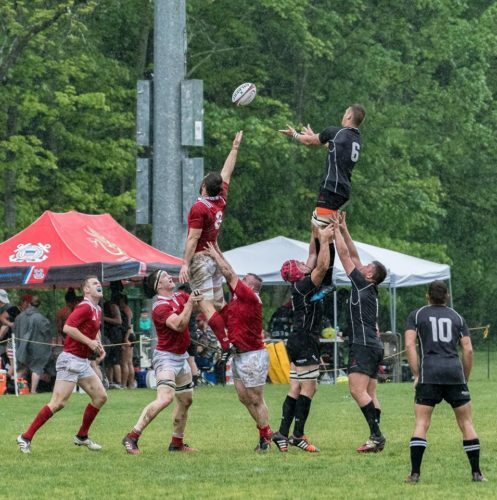 The Lions took advantage of the extra man and superior fitness to dominate the second half, outscoring Columbus 18 to 3 in the second half despite crossing the line on two occasions only to be called back for a knock on or infringement. The second half scores came in the form of two Eloff penalties and tries for Robert Stortz after a superb outside break by Angus MacLellan and a Kevin Lydon lunge for the line after some goal line pressure. The final score 33-20 to the Lions and the first Midwest title since 1999 for all in attendance to celebrate. Man of the match on the day was awarded to #7 Dave Whitney with JP Eloff and Angus MacLellan also having standout performances. I am extremely proud of every one of the players for the effort levels they gave and for their discipline and execution of the game plan I had for them to win on the day. Credit must be given to the forwards coaching staff of Marty Wiggins, Dustin Hugen and Matthew Priest for the dominance of our forwards at set-piece which was the platform for victory. 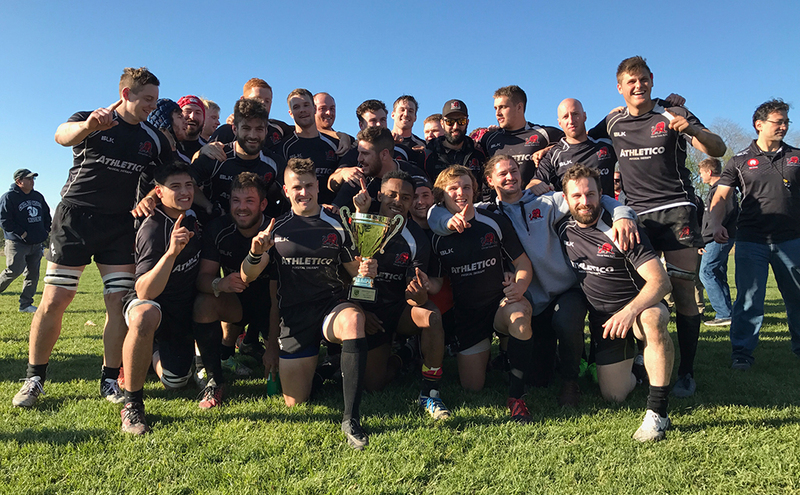 The Lions now qualify for the national quarterfinals in Pittsburgh where Rocky Gorge Rugby Club awaits, having won their conference. 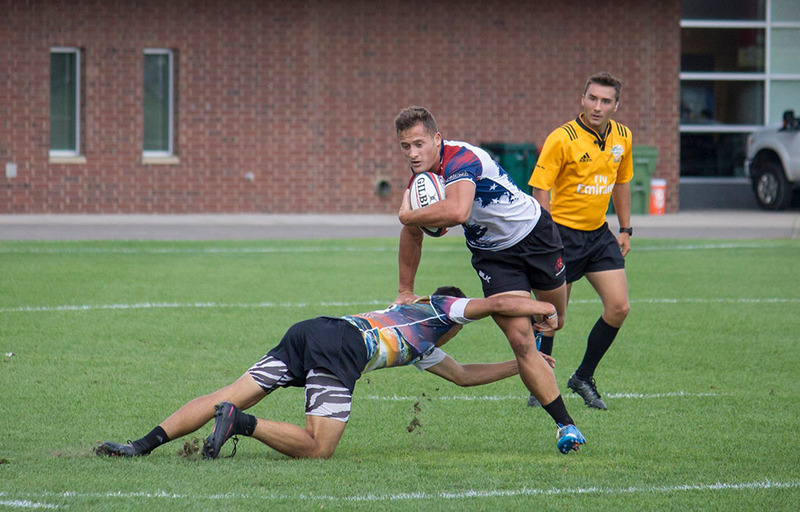 First up though, the Lions host Old Blue of New York this weekend in a warm-up game you will not want to miss. It would be fantastic to get as many Lions supporters to come out and meet the team in their last home game of the season before they head away to nationals! Shop at AmazonSmile and help the Lions! Amazon will donate 0.5% of the price of your eligible AmazonSmile purchases to Chicago Lions Charitable Association whenever you shop on AmazonSmile.